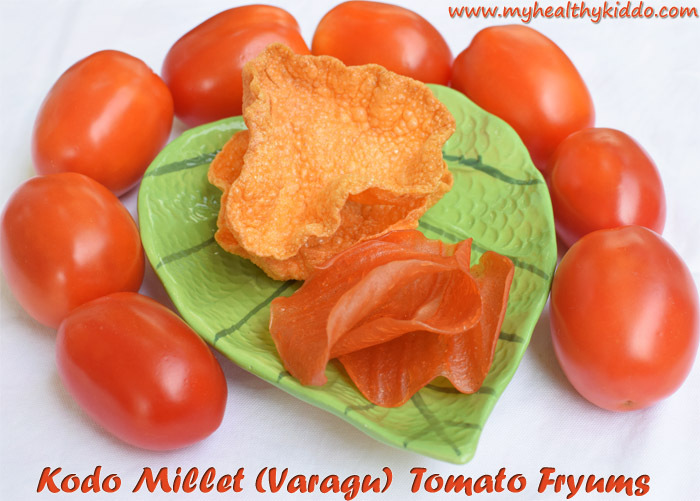 Kodo Millet tomato fryums/Varagu vadagam is a healthy treat for hot summer. These sun-preserved millet vadaams are homemade super-foods. Hope you still remember the small tube-shaped(hole in the centre), colored and fried papads that we would have had in our childhood. We used to wear it in 10 fingers and call it as Modhira appalam(Ring Papad). The long version of it is called as kudal(Intestine). 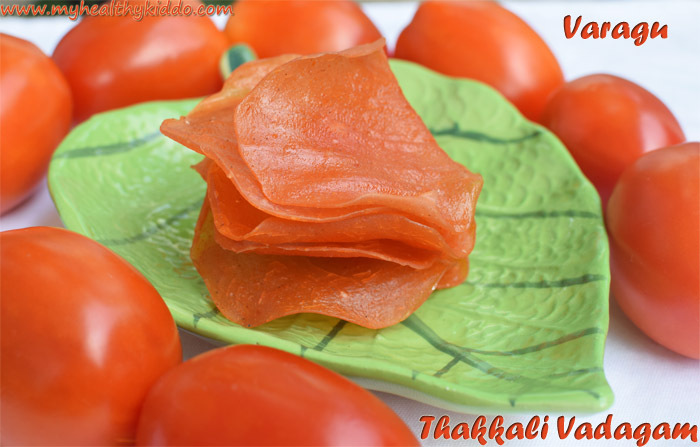 If you love those papads, then you will love this for sure! 1.Wash kodo millet/varagu arisi twice and separate the stones(Scroll for Tips). Soak it in water for 2 hours. 2.Chop 2 tomatoes and add it to mixie jar along with a dry red chilli. 3.Grind it smoothly without adding water. Pour it in a bowl and keep aside. Drain the water and add soaked millet to the same mixie jar. 4.Grind it well without adding water. Then add tomato puree and grind to a smooth batter. 5.The consistency will be lil thick like idli batter. Add salt and mix well. In a oil-greased banana leaf, pour a small ladle of batter and make small and thick dosa-like circle. 6.Pour ample water in idli pot, keep steamer or idli plate, close the lid and switch on the stove. Once steam starts coming out, Place the banana leaf(hold both sides else shape will be altered) and close the lid. Let the flame be high. Start making next dosa in another banana leaf. Once done, open the lid and it would have been cooked. 7.Take out the banana leaf and place the leaf with freshly drawn dosa into idli pot. Take cooked dosa/vadaam and place it in a wide plate and start drawing next dosa. Repeat this until the batter is over. Keep the plates in hot sun for 2-3 days. 8.Once dried completely, fry vadaam in hot oil and check. It should fry evenly and it should not stick to the teeth while eating. If yes, store the vadaams in air-tight containers and use it whenever required. 9.Whenever required, fry vadaams in hot oil. This vadaam turns brown very quickly. So, once oil is hot, keep the stove in medium flame and then start frying. Once vadaam is fried, take it out as soon as possible. Fry one by one. Naturally colored healthy vadaams are ready. Enjoy with variety rice or just eat as snack! Millets might have tiny sand and stones. Take water immersed millets in a vessel. Hold one end of the vessel rim and slightly lift up. While you shake the vessel to and fro using one hand, gather the millets in the other palm and transfer to another vessel in batches. In this way, the sand settles in the bottom to discard easily. Repeat this process twice or thrice until no sand settles down. Greasing oil in banana leaf before making first one is enough to make 25 vadaams. Check the water in idli pot after 10+ vadaams and pour more if required. If the water is less, steam will be less and vadaams won’t be cooked properly. Vadaams will cook in less than a minute. By the time you peel out the cooked one and make fresh one, the one in the idli pot would have been cooked. Batter should not be watery. While making circles, it should not be transparent to see the banana leaf through the batter. In such case, vadaams will break while drying. Add lil cumin seeds to the batter, if you like the flavor of jeera. 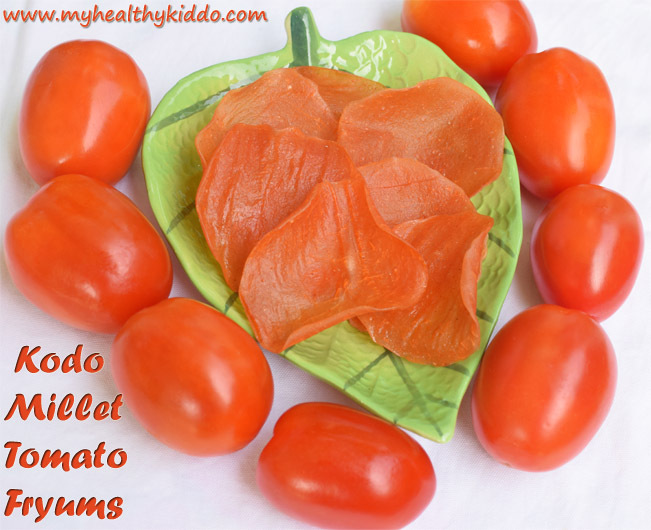 Reduce or skip tomatoes, if you don’t like its flavor. You shall skip tomatoes for plain vadaams. In such case, add 1/8 cup water while grinding the batter. Red chilli can be avoided or increased as per your spice level.